Greetings all! Well, can you believe it? It’s time to announce this year’s Felt United theme, which for 2015 will be … ‘H OME’. What does home mean to you? The word likely brings up different images for each and every one of us, so we greatly look forward to seeing how you define and interpret ‘Home’. It may be an actual geographical place, or perhaps a place you envision only in your imagination. It may be a source of identity or a state of being. It may be a feeling of security/insecurity, comfort or pain. Whatever you envision, we invite you to explore through your felt creations, what the word ‘Home’ means to you. Just a reminder that Felt United is celebrated around the world on the first Saturday of October, this year,October 3, 2015. In addition to your photos, which we look forward to seeing on the Felt United Facebook page, please also consider how you might be able to share your love of feltmaking with others. Perhaps a collaborative effort, or a gathering with other feltmakers to share your love of felting through an exhibition, perhaps an open studio, or something as simple as inviting a neighbor/friend over to see what you do. Whatever you decide to do in celebration on October 3, 2015, know that your feltmaking friends are celebrating in some way all around the world. 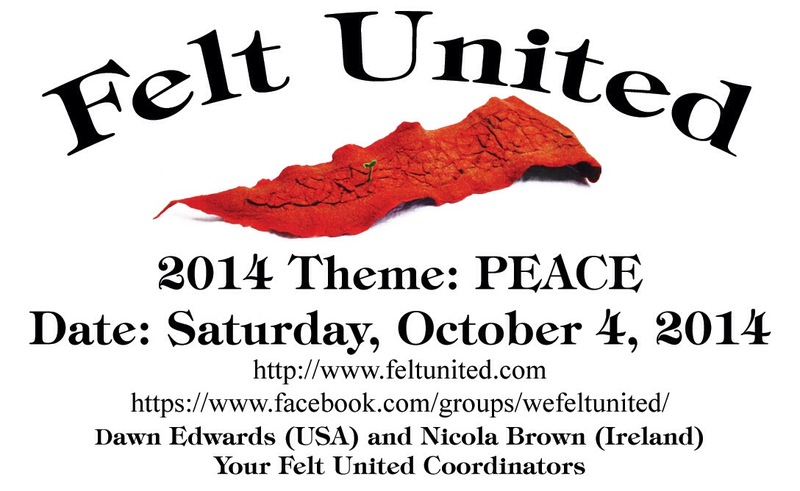 Please be sure to paste a link to your event on the Felt United Events page. Here’s to creativity, worldwide friendships, and of course, feltmaking. We hope that you will find this year’s theme, as with the themes of years past, to be a path for us to get to know one another better….this year by learning about you and your connection to home. While it’s still Friday here, I know that some of you are turning the page on Friday and have moved on to Saturday, October 4, 2014 in your area of the world. Wherever you are, we are sending our best wishes for a very Happy Felt United Day! Be sure to post your photos onto the Felt United Facebook page. We will try to get to the approval of those photos in as timely a fashion as possible….both Nicola and I will be felting the day away. too, so we’ll add photos just as soon as we finish our respective days. Nicola is hosting a fabulous day at Clasheen in Ireland where they’ll be creating a fantastic collaborative wall hanging, enjoying a potluck supper and having a fun stash swap/sale. Wish that I could be in two places at once….sounds like such fun! And, I am with felt artist, Robbin Firth, of Heartfelt Silks, where we’ll be felting and eco-printing felt hats in Hudson, Wisconsin, located on the beautiful St. Croix River. Wherever you are and whatever you’re doing to celebrate the day, I hope that you will enjoy every minute, knowing that your felting friends around the world are celebrating right along with you. I know that we’re all looking forward to seeing how the day unfolds around the globe. It’s been a great week leading up to Felt United Day…We’ve gained many new members (can you believe that we’re nearing 5,000 members?) and have had many wonderful Peace inspired photos posted. We hope that you’ve enjoyed this year’s Peace theme, which was inspired by the late humanitarian, Nelson Mandela. We thank you all for so generously sharing your heart and talents with the group. You are such an inspiration. Here’s to creativity, peace, worldwide friendships, and of course, feltmaking.